Paul Phillips was born in San Francisco, California on August 9, 1972. Paul is nicknamed “Dot-Com” because he earned his starting poker bankroll through the compensation he earned as Chief Technical Officer for Go2Net, an internet-based company. In the poker world, Paul Phillips has always managed to get involved in controversy. He was banned from the World Series of Poker in 2000 after he made comments criticizing the way Binion’s Horseshoe split the entry money between the players and the casino employees. 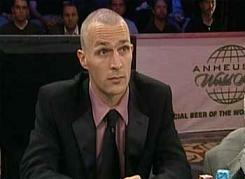 The ban was lifted in late 2001, but Paul Phillips has nevertheless played in the WSOP only infrequently. He played in one WSOP event in 2002, where he finished 2nd in the Triple Draw Lowball Ace to Five event. Paul Phillips didn’t play in the WSOP at all in 2003, but he did make three WSOP final tables in 2004. He’s also taken hits to his reputation when he said that Doyle Brunson, Johnny Chan, and Phil Hellmuth shouldn’t be included in the 2005 WSOP Tournament of Champions. In 2003 Paul Phillips made two World Poker Tour final tables, finishing first in one and second in the other. In his second place finish, Paul made a deal with his opponent, Mel Judah. Sports Illustrated portrayed this deal in a very negative light, and the World Poker Tour subsequently banned deal-making in its tournaments.